Less than a week ago, Bible mega-publisher Zondervan released its newest translation of the New International Version of the Bible and saw it fly up the charts to become the top seller in the Apple store under Religion/Spirituality and No. 13 seller across all categories over Christmas weekend. On Amazon, it was No. 3, at $9.99 behind older Bibles selling for $1.99. This is the first time any Bible translation has gone straight to digital. The print version goes on sale in March. Before the e-book launch, this new NIV was pretty much known only to scholars looking for changes in critical language. Zondervan already updated their original 1978-published NIV classic once this decade. The disastrous Today’s New International Bible, flamed out after scathing controversies over whether the translation was “gender accurate,” “gender neutral” or just theologically off base by dropping the old familiar pronouns that a bank of scholars ruled didn’t really express the original manuscripts. Back to the drawing boards. This time Zondervan leadership got out in front of critics. As promised two years ago when they announced the new, new NIV would be underway, they brought in in scholars, pastors, missionaries and laypeople to review any text changes with the Committee on Bible Translation. Their e-book Bibles are now 25% of Zondervan’s e-book revenue, according to a press release from the company, today. 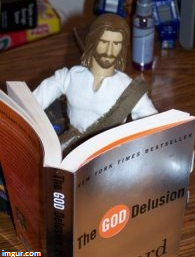 The picture of Jesus reading THE GOD DELUSION is great. I hope he was paying attention and now understands that his entire religion is just a bunch of reguritated myths and folklore that has no relevance to today's world. The bible has been replaced by the Hubble Deep Field space photograph and as time progresses, everyone will realize that.